Join to our V.A.P reward program now! We appreciate your business and always try our best to make your Active Baby experience a happy one. With no additional cost, you can earn store credit easily every time you shop with us. Our sales associates will gladly assist you over the counter in either our North Vancouver or Langley location. You will receive our V.A.P member card at no cost and gaining points under the name you registered with us. As soon as you are registered, the points you gain will show up on your receipt. How many points I can gain over my purchase? The points you earn will be generated as your store credit in our Point of Sale system. How many points do I need to collect before I can redeem them? You can redeem your store credit upon your in-store purchase at either North Vancouver or Langley location. Please present the V.A.P member card when you redeem your points for store credit. How can I find out how many points I have collected? The points you gain will show up on your receipt after each time of your purchase. It is also stored in our system. You can also phone us any time to check the amount of points you have earned. How to be a V.I.P member and what’s the benefit of it? Customers who attended a specific promotional event with us. What if I lose my receipt? Don’t worry! As long as you are a V.A.P or V.I.P member, we will always have your transaction details saved in our system. We can email your receipt to you any time upon your request. Still have questions? We're here to help! 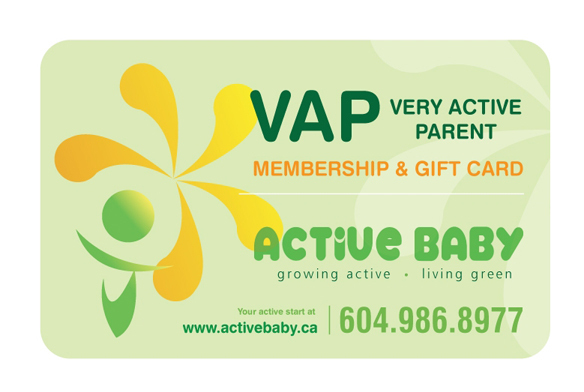 Email us at info@activebaby.ca or call 1.877.986.8977, Monday – Friday, 10am – 6pm PST. Don't forget to visit us at either our North Vancouver store or Langley store. Click here to find our locations, see store hours, and get the latest info on our in-store events.